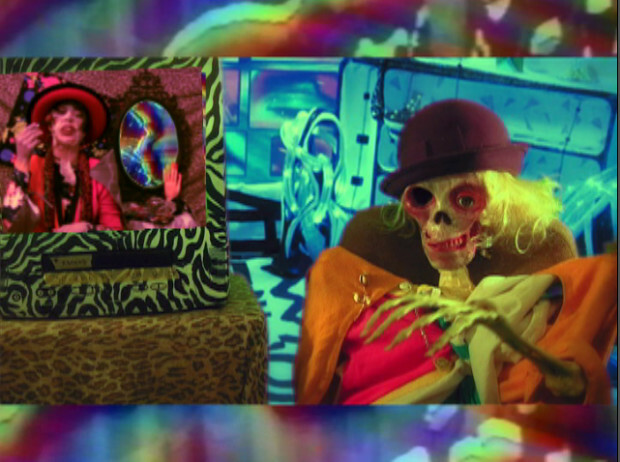 Browse: Home / 2015 / August / 22 / Killer Makeover: New videotape psychedelia from director Lindsay Denniberg! Let’s be honest, the 80s were a horrorshow: if Reaganomics, valley girls, dayglo t-shirts and acid-washed jeans weren’t enough to send you running for cover, then MTV, daytime talk shows, and a blitz of Arnold Schwarzenegger action films filled with his deadpan one-liners surely would. This was the decade in which Apple released its first home computer, the Cold War divided politics into smug capitalists and disdainful communists, and video technology supplanted both cinema and television as the godsend of mass entertainment. Fortunately, for anyone disposed to garish, sardonic humour, the 80s were also a Golden Age of cheesy genre films facilitated by the relatively low cost of video production as compared to 35 mm film; whether sci-fi, fantasy, action, or horror, it seemed like there was a gritty genre hero for everyone and a constant stream of innovative (or, if lacking vision, then at least as far-fetched as they were resourceful) productions to gleefully consume. This is the era to which drrrector [not a typo – ed.] Lindsay Denniberg lovingly paid homage with her first feature-length film, Video Diary of a Lost Girl (2012). Well-versed in feminist theory, Denniberg combined B-movie horror and John Hughes comedy in a provocative and visually psychedelic deconstruction of various genre tropes while giving center stage to an anti-heroine with verité charm. Killer Makeover, Denniberg’s next film project, continues along the path she established with Video Diary: super-saturated colours imbue the DIY production art and design with a fluorescent analogue video glow that makes a perfect complement to the wacky humour and bountiful gore. Fervently independent, Denniberg has launched a crowdfunding campaign to finance the project, for which supporters can receive a rare DVD copy of Video Diary of a Lost Girl. While Killer Makeover appeals most to the cult and b-movie crowd, with the perpetual leveling effect of the internet exposing ever-greater numbers to ever-weirder content, one hopes that Denniberg’s analogue worlds find a happy albeit twisted home in the digital universe.